Description The Challengers Fall 2017 Chess Tournament Saturday, November 4th, 2017 Regency Park Baptist Church 2001 North Janeway Avenue Moore, OK 73160 $425 Total Cash Prizes Based on min. of 40 entries. 4 Sections: Open, U1600, U1000, & U700 Open USCF Rated $125(1st), $75(2nd), $50 (3rd) U1600 USCF Rated - $100(1st), $50(2nd), $25(3rd) U1000 CXR Rated – (Cash Prizes awarded based on entries) U700 CXR Rated - (Cash Prizes awarded based on entries) Certificates will be awarded to winners in all sections. ($425 Cash prizes guaranteed based on minimum of 40 entries.) 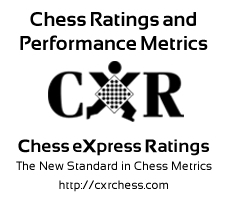 4 Rounds Swiss System, Open G/60;d5, U1600 G/45;d5, U1000&U700 G/30;d5 Affects both Quick and Regular rating. Open Round Times: 10:00, 1:00, 3:30 and 6:00 (G/60;d5) U1600 Round Times: 10:00, 12:30, 2:30 and 5:00(G/45;d5) U1000 & U700 Round Times: 10:00, 12:00, 1:30 and 3:30 (G/30;d5) Byes: One 1/2 point Bye available in Round 1-3 On-site Reg: 11/04/2017 8:00am - 9:30am EF: $20 USCF & CXR sections (Cash only preferred. Checks payable to “Joe Veal.” USCF Membership required for Open and U1600 sections. (USCF Membership available to purchase onsite.) No Smoking. Wheelchair Accessible. For more information contact: Joe Veal at 405.408.4659, or, email joeveal2016@yahoo.com. Directions Directions: At I-35 & I-240 Junction go south on I-35 to NW27th Street (a.k.a. SW104th) then (right) west approx. 1 mile to Janeway Ave. then (left) south 7 blocks to RPBC.